The same wetsuit that you cherish and love during your session can quickly turn into your worst enemy on the beach or in the parking lot as you struggle to remove it. Depending on the intensity of the struggle, your wetsuit typically ends up a wet, sandy ball of neoprene by the time you are officially changed, and then needs to be put somewhere in your car. Well, to help protect wetsuits from the sand and harshness of the change, and to keep cars nice and tidy, surfers have long been using plastic buckets and tubs to change and store their wetsuits in. The surfing industry has of course developed some of their own products to help protect wetsuits and keep cars clean. Both Billabong and Rip Curl have come out with simple changing mats. The design is ultimately the same — a nylon bag that opens wide enough at the mouth for you to stand in and have plenty of room to change. When you are finished changing, you simply pull the draw strings on the sides of the bag and cinch it up tight. The draw strings then act as an easy handle to carry the bag. They are basically the same product, both made by reliable companies, and both sold at similar prices ($25). I’d recommend the Rip Curl, but solely based on style. WetSand has also come out with an alternate option in the form of a tub. This tub is made out of 100% recycled polyethylene, and claims to have the durability of a car tire. Their flexibility makes them dent proof, and capable of carrying in one hand by holding on to both handles. It can also double as a holder for any other beach items, holding up to 10 gallons of water. While the recyclable aspect of this product is cool, I think I would still recommend the bag. It doesn’t take up as much space in your car. 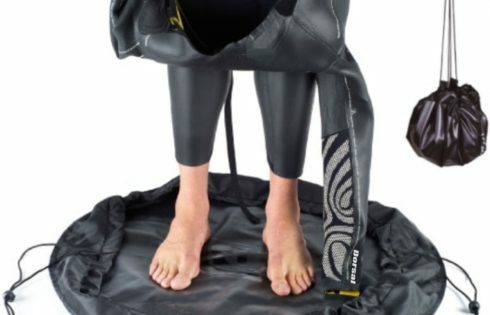 While I would never call this a necessary product, it is certainly a practical option for storing and transporting your wetsuit.